The Olympics are amazing, and 2018 was no exception. The competitive spirit, excitement and drama made it one of the best I’ve seen in years. But beyond the actual competition, what astonishes me most about the games is the back story of each athlete – the hurdles and sacrifices each went through to get selected for their respective team. While their friends were out having fun, eating cheeseburgers and sleeping in, they were in the gym, on the slopes, and at the rink. Sweating. Training. Working. This preparation gave them a chance for the gold. Olympic gold. It gave them the focus, discipline, and skills to perform under pressure – despite the lights, the crowds, the reporters, and the judges. You see, preparation is the gold standard for success in the Olympics. And it’s true in business and life. It’s a force multiplier…a success principal…an essential metric of achievement. It delivers results and creates champions who can perform when the heat is on and it really matters. Preparation is fueled by commitment and forged by discipline. It builds courage and ultimately confidence. It will will give you the opportunity to compete in the Olympics, fly an F-16, make a cold call, and deliver a game changing presentation. And while the Olympics are only every four years – here’s the good news. You don’t have to wait that long to compete to win. You’re in the Olympics right now. It’s called life. 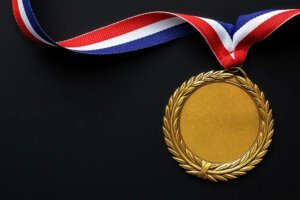 You have the opportunity to win a gold medal every single day: For your team, your customers, your family, and the person staring back at you in the mirror – yourself. You may not wear the medal around your neck, but you’ll wear it in your heart and your spirit. It will show up as the value you bring to those you work with and love, and ultimately be reflected in your income, relationships, and impact on the world. So if you truly want to be a game changer in your life…Go for the Gold! In life – you don’t just get what you deserve. You get what you prepare for.